Welcome to IRCTC Rail Connect App for Android. 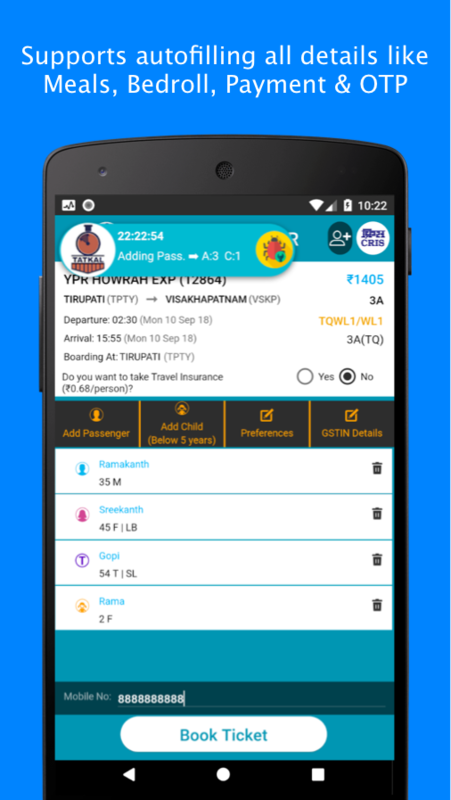 IRCTC Rail ticketingnow made simpler just by SWIPE and SHUFFLE, SELECT and BOOK.Install the newly launched "IRCTC RAIL CONNECT" android app andbook a railway ticket anywhere in India at your fingertips. Previewthe latest features in addition to existing ticketing services: ::New Users, register and activate from App directly. :: Advancedsecurity features of self-assigned PIN to login without enteringusername and password on each login. :: Supports Ladies,Tatkal& Premium-Tatkal quota booking. :: Current reservationfacility. :: Integrated with IRCTC e-wallet for faster and hasslefree transactions. :: Boarding point change facility. :: Syncing ofIRCTC's NGeT Web Site and NGeT Mobile App tickets. Now users canview, cancel or file TDR of e-tickets booked through officialwebsite (www.irctc.co.in) and vice-versa. :: Users can view thestatus of e-tickets booked through our authorized Online TravelAgents (OTA). :: Users can view and cancel old mobile app ticketsalso. Give early feedback: Let us know what you think and helpimprovements in IRCTC Rail Connect Android App. Enjoy the neverbefore experience of online ticketing with all new IRCTC RailConnect Mobile App. 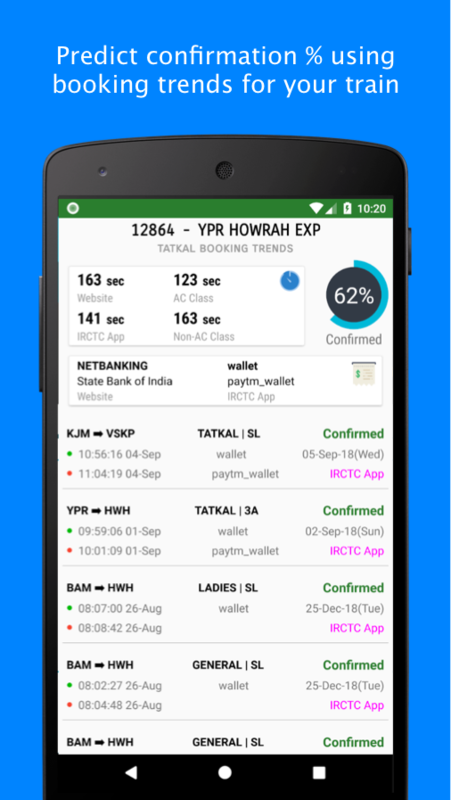 Trainman app is the highest rated train app to book train ticket,check pnr status, train running status, live train status, seatavailability & train enquiry. It is now available in 7 Indianlanguages namely Hindi, Marathi, Kannada, Tamil, Telugu, Bengaliand Gujarati (अब पी. एन. आर. स्टेटस ट्रेनमेन एप्प 7 भारतीय भाषाओंमें भी - हिंदी, मराठी, कन्नड़, तमिल, तेलुगु, बंगाली और गुजराती |)Salient Features of this train app are listed below :- Book TrainTicket Trainman is now an IRCTC authorised online travel agent.Train tickets can be booked on Trainman in less than a minute. Withsecure payment, easy cancellations and fast refund, it is the mosttrusted app for train ticket booking. Automagically read PNR numberfrom IRCTC sms The app automatically fetches PNR numbers from irctcpnr sms and saves it to my trip list. It also does pnr check inbackground from time to time and sends notification to user on anychange. Train PNR status facility with pnr prediction forwait-listed tickets is also available. Train between Stations &Seat Availability Find train between station, train enquiry, checkindian railway seat availability and get confirmation chances forwaiting list tickets for general and tatkal quota. If seats are notavailable, this train app will suggest alternate trains to bookconfirm ticket. Check availability for 4 months in a view with seatavailability calendar along with train fare for irctc. TrainStatus, Offline Running Status & Train Enquiry Check live trainstatus to know if the train is running timely or late. Passengerswhen sitting inside train can also check train running statusoffline for which no internet & GPS is needed! This savesbattery usage also. Know all trains arriving or departing at anystation in next 4 hours with live station status. This feature isan extension to train running status in internet mode. Also checkrailway time table, historical platform number and average delay ofany train at all its stops. Train Timetable & Schedule Knowtrain schedule and route of train with halt duration at its stops.You can also check all the intermediate stations between any 2stops while checking the live train status. This along with pnrenquiry prediction is one of the unique features of this train app.Fare & Refund Calculator Know fare for all the travel classeslike first ac, second ac, third ac, sleeper, garib rath, chair carand second seating in a click. Also check fares for seniorcitizens, children and under other concessions. For rajdhani,shatabdi and duronto trains, check out the dynamic fare. Find outcancellation charges deducted depending on when the ticket iscancelled while doing pnr enquiry. This feature can be seen ontrain PNR status screen. Platform number, coach position & seatmap Find out the platform number on which the train usuallyarrives. Also check the detailed coach composition of the trainwith rake reversal info. For any coach, passenger can check theseat layout plan. Get food in train Indian railway passenger cannow book tasty and hygienic food from Trainman app and get itdelivered at their seat while travelling. To get timely delivery offood, it is recommended that passenger should keep checking trainrunning status and contact the customer care in case train isdelayed at food delivery station. Journey Card 24 hours before thetrain trip, a journey card is displayed at the top of home screen.This card does pnr check and displays latest pnr status at alltimes along with live train status. Disclaimer This app isprivately managed and is not an official app by Indian Railway. Itis not affiliated with CRIS or NTES. To check pnr status and trainenquiry this app depends on other sources of information whichmight not be correct at all times. Welcome to Swedish Railways! Features include: • Quick and easybooking of Swedish Railway tickets. • Digital tickets for easymonitoring of all your journeys. • Relevant traffic information foryour journey. • Easy access to SJ Prio membership info and yourdigital SJ Prio card. The app also offers a number of additionalsmart functions to simplify your SJ journey. Bon voyage! Railway tickets without fees and overpayments. If you are tired ofwaiting at the ticket office or overpay third-party companies forthe opportunity to order a railway ticket from a smartphone, thenthis mobile app is for you! The "Railway Tickets" app is fullysynchronized with the official website booking.uz.gov.ua of JSC"Ukrzaliznytsia" and provides the ability to conveniently andquickly purchase tickets at any time with no additional fees,return them without approaching the ticket offices or track thehistory of traveling within an already existing profile. Intuitiveinterface of the app will allow you to instantly find a desiredticket and take advantage of all the options and benefits that JSC"Ukrzaliznytsia" provides to its passengers. DISCOUNTS ANDCONCESSIONS: - 10% discount when ordering round-trip tickets on the"Intercity+" trains; - discounts when ordering the 1st classtickets on the "Intercity+" trains: 30 and more days prior – 15%,29-25 days prior – 10%, 24-15 days prior – 5%; - "Bonus program"for the 1st class passengers of the "Intercity+" trains; -concessional travel for full-time students on the "Intercity"trains, class 2, 3, berth and ordinary coaches; - travel discountsfor children aged 6 to 14 years in accordance with the officialrules of JSC "Ukrzaliznytsia"; - free travel for children under 6years old without a separate seat. KEY FEATURES: - user-friendlyinterface available in three languages; - boarding a train in oneclick with QR code: just launch the app, rotate your smartphone toa horizontal position, and a ticket with the nearest departure timewill immediately appear on the screen. The action is available forall unused tickets that you purchased for yourself or your friends,children, relatives or other people; - full synchronization withthe website booking.uz.gov.ua, which provides tracking of travelswithin a single profile through both the mobile app and browser; -ticket prices are the same as on the website booking.uz.gov.ua; -possibility to purchase round-trip tickets; - ordering electronictravel documents with QR code that don’t need to be exchanged atthe railway ticket office; - ordering travel documents for childrenand students; - registration of additional hand luggage,transportation of animals, equipment; - returning tickets throughthe mobile app (prior to the train departure); - orderingadditional services: bed linen, tea, food pack, etc. ; - history ofall orders, unused tickets, return of tickets and a lot of otheroptions; - paying for orders with payment cards Visa, MasterCard; -24/7 support service (skype, phone, e-mail).